Last April, we blogged about the release of 30 tui (Prosthemadera novaeseelandiae, an endemic New Zealand song bird) onto Banks Peninsula to attempt to re-establish a self-sustaining wild population. Lincoln University lecturer Laura Molles has been leading the population monitoring. Laura and Karen Middlemiss, a Lincoln University summer scholar and Conservation and Ecology B.Sc. student, together with many keen local residents, have been spending their summer in south-eastern Banks Peninsula keeping a close eye on the tui as the birds explore what everyone hopes will be their new home. Good news is that the released birds have chosen to stick around, rather than fly off back towards their original home in Maud Island. After massive historical deforestation, the south-eastern corner of Banks Peninsula is proving once again to be suitable tui habitat, thanks to increasingly large and mature areas of regenerating native forest and ongoing predator control. 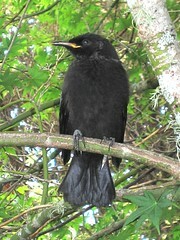 The second piece of good news is that the released tui have been breeding (!) and at least one nest has already fledged chicks. This amazing success less than 12 months into the project was reported in The Press newspaper on 18 Jan. 2010. Despite the excellent start, the young tui population is certainly not safely into the woods yet. Several nests have already been hit by stoats and rats, despite intensive trapping around known nests. Stoats, especially, seem to be having a good year this year on Banks Peninsula. Also, thirty birds is inadequate to create a population with healthy levels of genetic diversity (see Lincoln postgraduate student Phil Cochrane's ecoLincNZ blog post on inbreeding depression in small populations of New Zealand birds). Because of this, a second release of Maud Island birds onto Banks Peninsula is planned for later this year and the Banks Peninsula Conservation Trust is fund-raising to pay for this translocation. 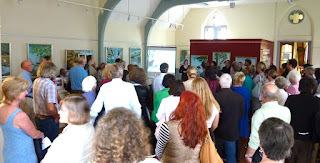 Laura Molles talking at the launch of artist Clare Reilly's exhibition "Return of the Tui - a celebration" Photo by Jon Sullivan, Lincoln University. The tui project has been fortunate to join forces with local artist Clare Reilly of the Primitive Bird Group. Her spectacular tui paintings are currently on display at Gallery O in the Christchurch Arts Centre and proceeds from some of Clare's sales are helping to raise funds for ongoing predator control and the translocation of more tui. Laura Molles gave a talk and slide show about the tui release at the launch of Clare's exhibition on Tuesday 19 January and will repeat her talk in the gallery on Sunday 24 January at 2 pm. If you're travelling on Banks Peninsula and see tui, Laura Molles and her team are keen to get your observations (where, when, what bird(s) (all released birds have colour bands on their legs), and what they were doing). Even if you don't get a close enough look to see the colour bands, Laura would still like to know where tui are on Banks Peninsula. You can send your observations to Laura or you can enter them online on the New Zealand Biodiversity Recording Network website (www.nzbrn.org.nz, the subject of a recent ecoLincNZ blog post).